Sharing Your Passion When You Travel - JP loves LIFE! I love to travel. Love it. For work or for personal reasons, I love going new places and meeting new people. And I frequently find myself with the opportunity to talk about what I do. That may be because I try to create those opportunities. No, I’m not one of those people who talks constantly to the person seated next to them. In fact I usually plug into my iPod. But I do find that showing I’m passionate about things, helps people feel more comfortable asking a question. 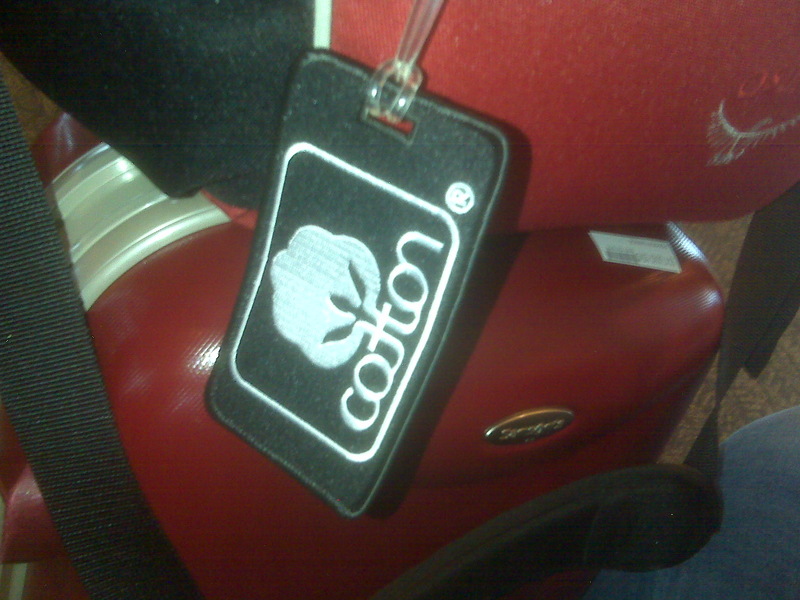 The seal of cotton in a classic black & white adorns the red rollerbag I usually take on short trips as well as my routine briefcase. I love the look of this and the clean distinctive look grabs people by the eye. You can order some from my friend Roslyn at Cotton Specialities — her travel products including this luggage tag rock! 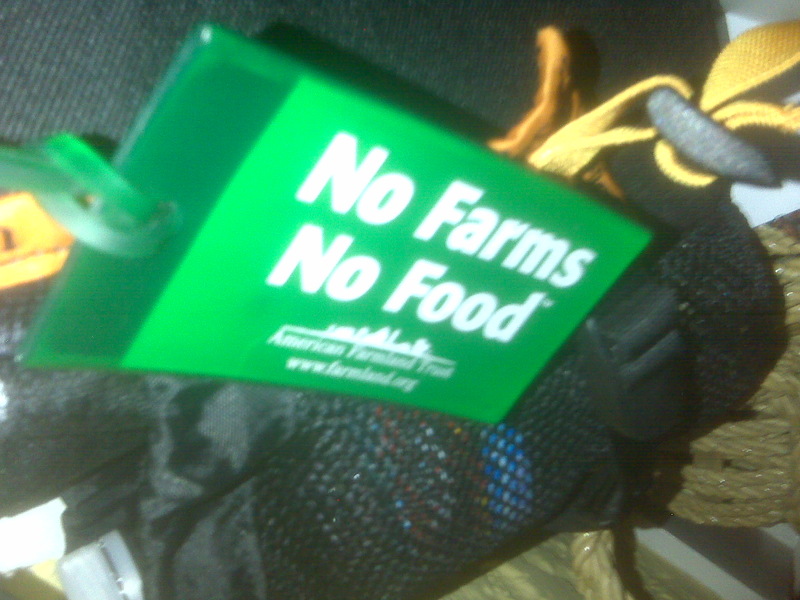 The American Farmland Trust tagline “No Farms No Food” is a good reminder too! The tagline is a great one and supporting the organization can get you merchandise with the cool tagline! This tag rocks my camera bag! I’ve said it before…. people notice t-shirts and jackets. My “WTF Where’s the food without the farmer?” shirt certainly opens eyes and it can get people to ask questions. I frequently wear a cap or one of a number of shirts from them. I also have some from work that are fun to wear — whether its a Deltapine cotton shirt, the Dekalb winged ear or something else. And Fastline posts a farm-related t-shirt of the week on the Fastline blog. And I have to say, Crystal’s blog post about cowgirl/cowboy boots being a great way to start a convo with urban folks. And a way to teach me what the thing I always see in Texas is called. LOL! Taking along the farm magazines I haven’t had a chance to read yet. Folks seem amazed when they see the cover of Cotton Farming magazine or something. Mentioning that you have friends that grow wheat when you are at a pasta restaurant or talking a bit about how great it is to have fresh sweet corn at your doorstep. That iPad… you know I wrote recently about using visuals on the go to interact with folks. I’d love to hear your best travel practices for getting an easy, effective opening for telling your story about your passions while you travel. Great post! I am now on the search for luggage tags for my trip to Australia. Currently, I have ear tags on them, but sometimes people don’t always know what those are. I also always bring an Angus Journal or other ag publication on my trip. I love this post! I always start conversations with magazines I take on trips. The iPad is something I haven’t thought about before. When I get mine I will have to set it up with lots of ammo! Can’t wait to meet you tomorrow! Tomorrow!!! Lookin forward to it! Baling wire? I may have to see this AND take a photo!